Global marketing research solutions innovator Civicom will host a webinar on the importance of mobile in market research and the many ways market researchers can utilize mobile in their qualitative research studies. The webinar will run in several time zones on July 18 and 19, 2018. Civicom Marketing Research Services, leading provider and innovator of marketing research solutions, continues to advocate for better solutions and market research techniques to bridge the gap between researchers and key insight discovery from respondents all over the world. Civicom offers various mobile solutions that can be optimized for various qualitative needs including virtual in-depth interviews and focus groups, online bulletin board studies, shopper insights, usability research, and audio diaries and patient journeys. Last year, Civicom launched ThoughtLight™, a mobile qualitative tool for researchers who want to maximize in-the-moment insights from respondents using their mobile device. 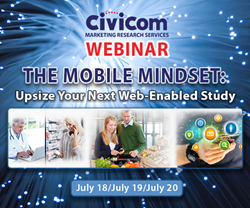 Civicom’s webinar entitled “The Mobile Mindset: Upsize Your Next Web-Enabled Study,” will enlighten attendees on how mobile can play a bigger role in qualitative research projects and its key role in research immediacy, familiarity, and effective engagement with respondents. Attendees will uncover the benefits of mobile in their research, learn ways to utilize mobile-optimized market research platforms for more accessible, creative, and engaging research, conquer the pain points of incorporating mobile in their projects, and understand the advantage of the mobile-first thinking in the market research industry.